Fassinating Fassbender - A Michael Fassbender Fan Blog: Hunger here in Ann Arbor! Hunger here in Ann Arbor! I just got the movie preview weekend email from the premiere art house theater in my town. Finally, 'Hunger' is here to be seen for my third screening. I saw it for the first time in Toronto at the film festival in September, then in London in November, and now I'm going to take my friend Laurie to go see it possibly this weekend. I'm excited because I'm proud to declare that Ann Arbor is a diverse and culturally rich college-town and many people here are from other parts of the country and the world because of the University of Michigan. 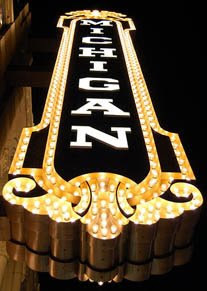 And when I go to watch films at the Michigan Theater, it is something that is not shown at the cineplex, nor are there matinees - it's $10 a pop, at each screening. Needless to say, the theater crowd is the arty type also and makes the film experience more pleasurable. The last film I saw there was 'Milk'. HUNGER Opens tonight at the Michigan. "A sensational feature debut...Magnificent." - Telegraph, UK. This celebrated film by contemporary visual artist Steve McQueen won the prize for Best First Film at Cannes and the Discovery Award at the Toronto Film Festival. It tells the story of the suffering of the prisoners (and guards) in a Northern Ireland prison in 1981, focusing on the hunger strike of Irish Republican Army leader Bobby Sands. Not Rated. 96 minutes. Visit Michigan Theater for more information. That's so awesome! This post made me scramble to see if/when HUNGER's coming to the independent theatre in my town. And it turns out it'll be here next Friday. I'm excited, can't wait. I know! I'm so excited it made it here to the Detroit area. Now, I probably won't see it again by myself (I'll only go if Laurie wants to go) as this really isn't the type of movie that you see on repeat viewings, twice is more than enough and that's to get a better understanding of the historical facts of the hunger strike. It really is a brutally raw film. So if you haven't seen it yet BPW, please see it next week as I would love to hear what you think of it. BTW, what city are you in? Simone, I'm in Cleveland, OH. Well, just outside it. I've seen clips of HUNGER, but not the whole thing, so I'm going to go see it I think. Ah, Cleveland, I like Cleveland, I go there for concerts and hanging out. It's only a 3 hour drive away. Do you have anyone to go see Hunger with? Or do you plan on seeing it solo? I might end up going alone. I think the subject matter of HUNGER might keep my friends away. That's cool though. Hunger is not everyone's cup of tea, that's for sure. So instead of sitting next to someone who will wince and whine, just go alone out of your Fassinator duties and enjoy the movie. I can't wait for you to see it. If my friend Laurie doesn't want to go, I'll pass on seeing it again. I don't need too, but I hope it has a great showing here in A2 for the one week it'll be in town.